The Unrepresented Nations and Peoples Organization (UNPO), in cooperation with the European Free Alliance (EFA) and Centre Maurits Coppieters (CMC), will convene a high-level conference entitled “Auctioning Human Rights? Democracy and the Right to Decide”. The conference is hosted by Josu Juaristi Abaunz MEP (GUE/NGL) and will be held at the European Parliament in Brussels, room P1C051, on 2 July 2015, from 9.30 to 17.00. By bringing together decision makers, academic experts, as well as human rights and political activists, the conference will highlight the political and economic dimensions determining the fulfilment of fundamental human rights of peoples in seeking self-determination and democracy. The speakers will present a diverse set of cases: from Catalonia to Scotland, from Balochistan to Kosovo, from Ogaden to Abkhazia. Notable experts and representatives of these communities will shed light on why some nations and peoples have been able to exercise their right to self-determination successfully, others have achieved the creation of an independent state, and others yet continue in their struggle to determine their future status or even enjoy their civil, political, economic, social and cultural rights. The conference will tackle an often forgotten question: is the denial of rights a result of geopolitical considerations and economic interests? 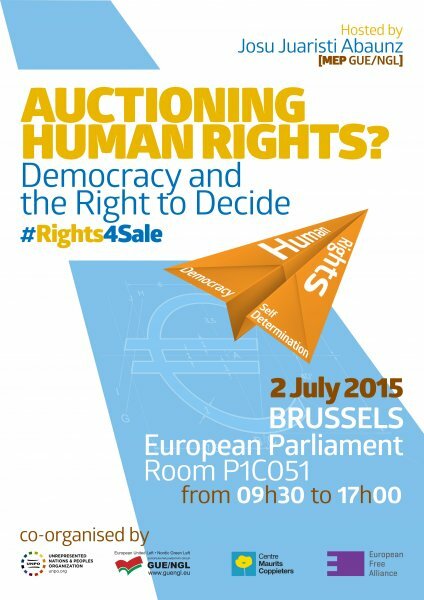 Is there a systematic, but ignored pattern of auctioning of human rights? There is no shortage of examples of underrepresented peoples or territories, rich in natural resources. Occupied or exploited by a dominant force (such as a government or state level and multinational corporations) without consultation, approval or compensation, they’ve constantly demonstrated their will to access, own and control their lands and resources, and to be autonomous or even independent. - Where is Scotland Now? - Empowerment at the Macro-Level: What can the EU offer? - Collective Rights Secondary to Economic Interests?